I cannot believe what I’ve just read. I suppose it shouldn’t surprise me, particularly when it’s coming from a group that is STILL calling for the release of cop killer Mumia Abu Jamal. The Congressional Black Caucus flew to Cuba recently, but they weren’t going to visit Guantanamo Bay. They went to visit former dictator Fidel Castro and current dictator Raul Castro. Their verdict? Let’s talk about the Castro brothers’ basic human qualities. Russian KGB and East German Stasi trained the “officers” of the Cuban Interior Ministry. That alone should give you an idea of what “human rights” and “human qualities” are to the Castros. Not only are you not allowed to leave Cuba, you’re not allowed to even ask to leave. Trying to leave Cuba will automatically result in a five-year prison sentence (which, unlike America, does NOT translate to six months in prison followed by four and a half years of parole). If given permission to leave the country on business or for school, your relatives–particularly children–are required to remain behind to ensure that you return. By 1970, just ten years after Castro’s revolution, an estimated 5,000 people had been executed by the communist government. Most were given little to no trial for any offense deemed dangerous to the government (to include speaking against the communist regime) and were executed immediately upon arrest. An estimated 40,000 have been executed to date, if you do not include those killed while trying to escape the island in crude boats or other craft (incidents like the 1994 attempt by the Cuban navy to stop a group of citizens trying to escape on a WWII-era tugboat come to mind–41 of the 72 passengers, including women and children, were killed when high-powered fire hoses from a warship swept them off the boat’s deck). Ask Armando Valladares about Castro’s “human qualities.” He was in prison from 1960 until 1982 after he refused to place a placard on his desk in support of the communist government. He was only released after the French intervened on his behalf because of the tales of horrid torture (you think the stories coming from Abu Ghraib are bad? At least our soldiers haven’t beaten inmates half to death and urinated on them while they lay bleeding on the floor after days of depriving them of water). Ask doctor Oscar Elias Biscet, recently sentenced to 25 years in prison for vocally opposing Castro. Or ask Reinaldo Arenas, the gay Cuban playwright sent to prison on 1973 for “ideological deviation” (meaning they tossed him away because he was gay) and tried to smuggle his work out of the prison, only to be discovered and severely tortured–nearly to death. He was forced to renounce his writings and his homosexuality to be released and escaped Cuba in 1980. Castro’s “basic human qualities” end with the fact that he is, by scientific definition, of the homo sapiens species. Beyond that, there is little to prove that he his human in any way, shape or form. That American lawmakers are praising him makes me absolutely sick, and proves even more that the Democrat party is trying all it can to move my country toward socialist ideals. According to Attorney General, Eric Holder, we are a nation of cowards. Yup. You, me, everyone. When it comes to race – we are cowards. Holder says….. I guess we can expect more of this type of garbage from the Obama administration. But I don’t understand why. Remember – the Messiah was supposed to heal all rifts, rescue the nation and lead us into the age of Aquarius. Now it just seems that this bumbling administration has no idea where it is going or what to do. Add to that the divisiveness being preached from the perches of the White House. 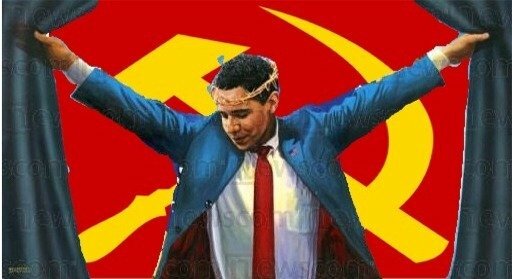 Obama might as well have appointed Rev. Jeremiah Wright to the AG position. Michelle Obama thinks this is a “mean” nation – a nation which she was never proud of until her husband became the apparent Democrat nominee. Mr. Michelle Obama, believes that we are a nation plagued by those bitter people clinging to guns and religion. There is no hope or unification coming from this administration. Just bitterness. A bunch of people with chips on their shoulders. But guess what folks? These angry idiots are in charge now. The thing that annoys me most about Holder’s comments is not just the subject matter. Remember former Texas Senator, Phil Gramm? He was torn apart by the MSM, thrown under the bus by Johnny Mac and eventually resigned as a McCain advisor. His sin? He said we were becoming a nation of whiners. So, it’s worse to be a whiner than a coward? I’ll never understand these things. To be honest, one of the reasons that I don’t blog as much as I used to is because I am becoming more disenchated day-by-day. There is so much hypocrisy in the mainstream media. There is so much venom leveled against conservatives and Republicans in general. I’ll admit to you – right now I feel a sense of political hopelessness that I have never felt before. I know that things are not totally hopeless, but the events of the last few years sure can take the wind out of your sails as a conservative. I often wonder what the point is of all of this. Everyday we continue to move closer to European socialism and lose more and more of our liberties. We’re spending ourselves into oblivion. We have lost our regard for the value of life. We have forgotten the lessons of 9/11 and want to negotiate with the Islamist thugs who want to kill us all. It saddens me to see this all around me. Presidents Reagan and Bush Sr. oversaw the demise of communism as a form of government and socialism as an economic system. Yet, we have now seen a resurgence of socialism in the West. And while the US held strong against the socialist tendencies that nearly bankrupted Western Europe, we seem to have bought into this crazy experiment hook, line and sinker. Even President Clinton was forced into accepting major welfare reform by the GOP. That reform undid a great deal of the damage dating back to the overrated administrations of FDR and LBJ. In the late 90s things looked great. But look at where we are now. We have reverted back to the failed policies of yesterday. See if you can balance democracy and socialism. See if democracy can survive absent capitalism. It won’t happen. But Obama and his minions will destroy this nation trying to prove that such a system can work. And if it doesn’t, you can be sure that democracy will be compromised in order to accomodate socialism. Sorry for the rant. I don’t mean to sound cynical. I’m just tired. Tired of it all. I’m trying to fight, but it seems that all I can do these days is rant and call it as I see it. I take heart in the fact that there are so many conservative folks blogging and opining online. Conservative talk radio is strong and popular (for the moment anyway). I sense some grassroots, but I don’t see it translating into much these days. The most disconcerting thing of all is that Republicans allowed this to happen. That really hurts me and you in so many ways. Most of us are conservatives first and Republicans second. Yeah, yeah. But the GOP is our vehicle in government. The revolution of 1994 is a distant memory. The corruption and loss of direction that we saw from the GOP after 1994 led us to where we are now. I don’t know when or if the next Reagan or Gingrich will surface and lead us out of the wilderness. I used to believe that all things were cyclical in politics. But I’m not sure anymore. Maybe we have moved irreversibly in a direction that will lead us down the path of destruction. And perhaps Mr. Holder was correct. And Mr. Gramm too. Maybe we are a nation of cowards and whiners. Egged on by the fear that was instilled in the American people by liberals and Democrats, we have apparently sold our souls to the Devil. And now we will see the true hell that awaits unless we wake up and change things – fast. Che did far more than refuse to turn the other cheek. Who was this guy, and why is he so idolized? I’d read a few things here and there, but I hadn’t really delved into the subject. Until now. 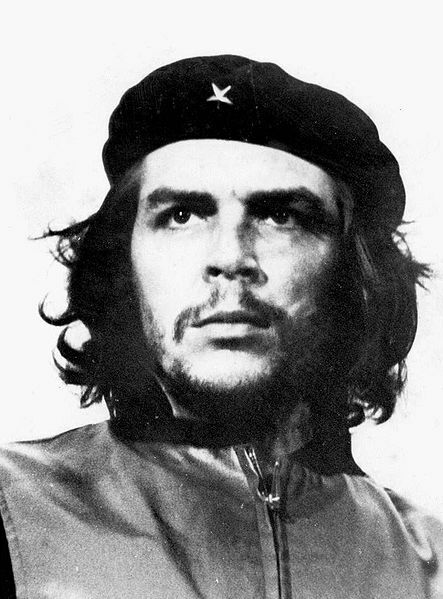 Che’s image has been captured at pro-gay rights rallies, pro-abortion demonstrations, anti-war protests and all manner of other such public displays of political leaning. His image has become even more prevalent at anti-Israel demonstrations of late. Any time there’s a protest against anything conservative, Che shows up on someone’s clothes, often accompanied with the famous “viva la revolucion” warcry. If any of these people had any idea what the truth was, they’d burn everything they have with Che’s likeness on it. His current followers describe him as an Argentine physician and a revolutionary. That’s usually the extent of what they know. We know that Che went to medical school in Argentina, however there’s no evidence that he graduated and actually became a doctor. If you really dig into his history, you find that he pretty well failed at nearly everything he did. The only thing he seemed to be really good at was killing. After helping the Castro brothers overthrow the Batista regime in Cuba, Che was sent to govern the La Cabana prison. There, he appointed himself the magistrate and began “trials” of those accused of being counterrevolutionaries. The trials (if you can call them that) were a joke. They were short, the accused were not given the opportunity for a defense, and within hours of conviction their sentences were carried out by firing squad. Che himself liked to deliver the coup de grace (a bullet to the back of the neck) to certain prisoners. The quote at the beginning of this writing was part of Che’s “Message to the Tricontinental.” He often described himself as bloodthirsty, hateful, willing to do anything necessary to protect the revolution. And this is the guy the culture is holding up as their hero. In Camaguey, Che began the gulag system where those deemed “unfit” were imprisoned in concentration camps. Homsexuals and AIDS victims often populated these camps, as did anyone who had the temerity to question what was going on. These prisoners were systematically tortured, raped, and often killed. Any who survived were traumatized for life. We’re wearing this monster on our clothes. We make movies glorifying his life and leave out the parts we don’t like. We protest in support of gay rights wearing the image of a guy who made it illegal to be gay or lesbian and imprisoned and/or killed anyone who broke that law. We protest “the Bush regime” and decry as Nazis anyone who disagrees with our liberal ideals, and we do it waving a banner proclaiming as a hero a man who made it his mission in life to execute (read: murder) anybody who disagreed with the Marxist revolution. Che’s own journals expose his violent nature where he describes in vivid detail how he put a .32 caliber pistol to a man’s head and pulled the trigger after he asked to leave the country. He even talks about staging mock executions, using it as a form of psychological torture to scare any potential dissidents into shutting up. If I were to walk around wearing a shirt with an image of Adolf Hitler on it, I would be immediately lynched and possibly beaten to death. Hitler’s crimes are well-known and he is so despised in America that even the possibility that you may hold him up as a believable man evokes violent reactions in the public. Yet even though we have documentation coming out our ears about Che’s crimes, we’re erecting statues of him and using him as a symbol of revolution, fighting back against things we disagree with. It’s like presenting Hitler as a hero because he was a vegetarian and an animal lover. Unfortunately, he was also a mass murderer. So was Che. Che chic has so overwhelmed America that I can’t go anywhere without seeing this guy plastered on something. I went out to dinner with my roommates earlier this week and saw at least three people wearing Che shirts. We should be taking it as a personal affront when we see people wearing his image, because he hated gays and liberals (not to mention conservatives, who were the first to be killed). 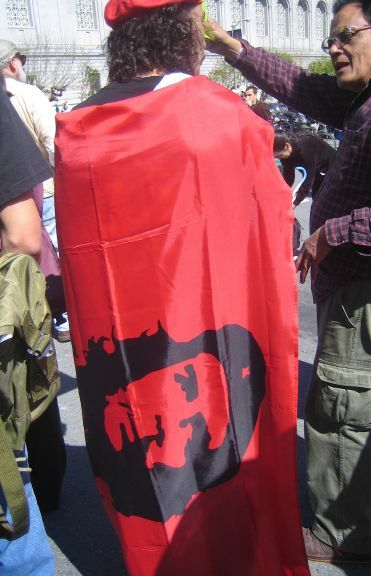 The dichotomy of it mostly being liberals who wear Che paraphernalia is not lost on me. Not long ago, a 73-year-old man in New Jersey was waiting for a bus when he spotted a street vendor selling Che t-shirts. He went and bought one, then immediately set a piece of newspaper on fire and burned the shirt. A police officer who responded asked him why, and he related the story that he was a Cuban exile whose father had been killed by Che at La Cabana. The owner of the stand where he bought the shirt openly said he thought older Cubans like him are crazy; you can take a lesson from this. The younger Latinos who idolize Che think they’re crazy, but the Cubans who survived Che’s part in the revolution are absolutely flabbergasted at the phenomenon of Che becoming a new hero. There’s a reason for that. It’s because they remember what he was like and what he stood for. I agree with them. I don’t understand why we’re not doing more to educate ourselves on the truth about Che Guevara.